me and him: isn't this just the cutest Christmas airport ever? isn't this just the cutest Christmas airport ever? Well we had ourselves a party this weekend! My Mama Mia and Sissie Audrey jumped on a plane (for $75 round-trip. holla!) to come see me and Jas and our neck of the woods. It was a quick little visit, but we managed to cram in lots and lots of fun things. In fact that we partied so hard that I didn't think to take any photos until we were at the darling darling Long Beach Airport and they were scurrying away to catch their flight. Anyway—the first night we got ourselves some de-freakin-lish pizza from Italian Pizza Rosa because we like trying new things and we really like good pizza and because Lauren @PeaceLoveLauren told me it was tasty tasty. And it was! We followed up pizza night with a day full of shopping our little hearts out (including Jason, who didn't complain even once! I love that guy). By the end of the trip we went to H&M twice, Sephora once, every night a late night of talking/eyebrow trimming and Audrey was thoroughly addicted to pomegranate Pinkberry. It was a good little party. On Monday I get to jump on a plane at that cute little Christmas airport. Hello family! Hello snow! It's making me smile just thinking about it! Woop-dee-WoopWoop! you tried it! isn't it FABULOUS? and super ghetto? oh i'm so glad you liked it! yay! you're comin back! i want to see your pretty face!!! I LOVE that airport! haha and I'm flying there for christmas too =) I am SO freakin jealous of you.... H&M... Pinkberry....I love CA! tell it hi for me ;) and that I miss it very much! 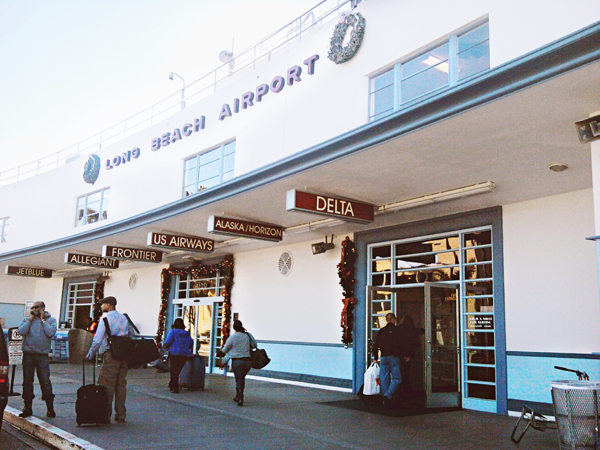 I am glad I'm not the only one who likes the Long Beach Airport. I strangly adore it.